Distillery warehouse and other black fungi from walls and other surfaces. Some fungal growth is stimulated by low level exposure to ethyl alcohol vapors. 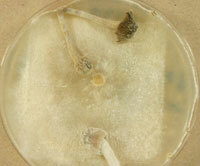 Baudoinia panamericana is one of several species of warehouse staining molds, angel's share fungi or whiskey fungi. Baudoinia species are saprotrophic members of the Capnodiales (Ohm et al 2012). A study of 19 UAMH isolates using multilocus DNA sequencing indicated that the genus Baudoinia comprises five geographically patterned lineages representing four new species (Scott JA et al 2016 in press). See these sites for more information on Baudoinia and its role in the ecology of warehouse staining in distilleries. Genome sequencing.Type strains for five species of Baudoinia are represented at UAMH. These include UAMH 10762 B. panamerica for which the genome has been sequenced and the epitype strain of B. panamericana UAMH 10808 isolated from a tree near the Remy Martin distillery in France. Baudoinia is one of several genera representing black, slow growing, so-called meristematic fungi that form sooty black deposits on rocks, archeological monuments, trees and other surfaces. Several of these genera are well represented in UAMH. Two recently described fungi are Hispidoconidioma alpina and Atramixtra arboricola (Tsuneda et al 2010, 2011) isolated from black growth on twigs of Larix lyallii, and declining Picea glauca respectively. Specimens were collected in Larch Valley, Banff National Park, AB. Rarely, these fungi occur indoors. UAMH 11589 is another slow growing black meristematic fungus isolated from carpus dust in Nevada. We identified it as as Pseudotaeniolina globosa by sequencing of the ITS region. This rare species, originally described from rock surfaces, is represented by only three other isolates worldwide. Wood spalting fungi. Wood spalting is the production of pigments for potential decorative and commercial use. The utilization of specific fungal species and isolates and improvement in methods to enhance pigmentation have been studied extensively by SC Robinson, D Tudor and PA Cooper (Forestry, Univ Toronto) and their associates (see Robinson et al J Wood Sci 2013; Robinson Appl Microb Biotech; Robinson et al Appl Micro Biotech; Robinson et al 2011; Tudor et al 2012; Tudor et al 2013. Among fungal isolates tested were Scytalidium cuboideum (formerly known as Arthrographis cuboidea), several isolates of Xylaria polymorpha and Trametes versicolor. Although Scytalidium cuboideum is a species well represented in UAMH, these are the first isolates studied in these types of applications. In 2012, Chlorociboria aeruginascens, which naturally produces blue-green staining in wood, was evaluated under laboratory conditions to develop methods for enhancing its potential use in wood spalting. As well, sequences for the isolates were deposited in Genbank [UAMH 7614-7615, 11655-11656]. Coccidioides immitis and Coccidioides posadasii. The Fungal Genome Initiative of the Broad Institute, Cambridge, MA, produces and analyzes sequence data from fungal organisms that are important to medicine, agriculture and industry. Uncinocarpus reesii strain UAMH 1704 is part of this project and sequences are deposited at DDBJ/ EMBL/ GenBank under the accession AAIW00000000. 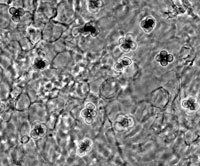 See publications on Uncinocarpus and its phylogenetic relationship to Coccidioides. Ammonia fungi are ones in which growth is stimulated by addition of urea or other nitrogenous materials to forest soils. The new mushroom species, Coprinopsis neophlyctidospora, was discovered by Dr. K. Suzuki, Chiba University during surveys for ammonia fungi in Alberta boreal forests conducted while on sabbatical leave at the U of A. This mushroom fruits readily in culture. 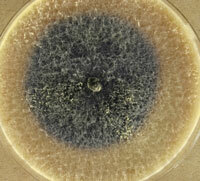 The Annual Report for 2013 provides a synopsis of the diverse ways in which UAMH fungi have been used. Previous reports: 2012, 2011, 2010, 2009, 2008, 2007, 2006, 2005, 2004, 2003, 2001, 2000.